Plyos gained its fame and popularity thanks to artists like Isaac Levitan, who were inspired by some of its amazingly scenic spots. 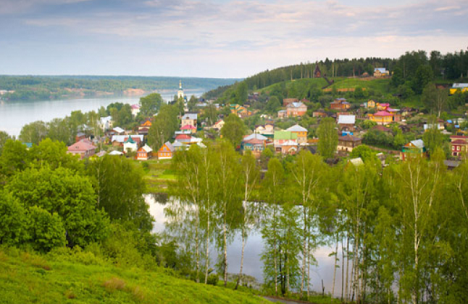 Every year some 150,000 tourists visit the town of Plyos, which is known as the Pearl of the Volga. The first mention of this town, as a fortress on the Volga, dates back to the 12th century. However, despite its military history, the city gained its fame and popularity thanks to artists – for its amazingly scenic spots. Plyos, built beside a straight and deep-water stretch of the river bed (this is what the name of the city suggests: plyos in Russian means a stretch of river), was founded as a fortress. High hills provided ideal observation points to spot the emergence of possible enemies from far away – it was for this purpose that protective ramparts and watchtowers were built. Remains of the fortress rampart are still visible on Sobornaya Hill (Cathedral Hill), or Soborka in local slang. A monument to the city's founder, Vasily the First, and the Uspensky Cathedral built in 1699 stand right outside. If you walk up this hill towards the Volga, you can get to an observation point which offers a beautiful view of the river – fortress watchtowers used to stand here in the past. All the historical sites in Plyos are easily in view from the perimeter of Cathedral Hill. An embankment and the streets parallel to it (Gorky Street and Lenin Street with Bazarnaya Square between them) as well as the Posad, which was the craft and trading quarter of the town, are located just beneath the hills. In the centre of the Posad, on Bazarnaya Square, Voskresenkaya Church (Resurrection Church), built in 1817, rises half way up the hill. It can be viewed particularly well if you walk up to the top of Voskresenkaya Hill. Plyos became wealthy in the 19th century and brick buildings were built there when the small town on the Volga became a centre for bread and fish trade in Russia. The mansions of past merchants are still a delight to the eye of the leisurely tourist on the embankment walkway. The streets of the town are a nice place to buy souvenirs, have a cup of coffee, and enjoy life with a 19th century backdrop. In the 19th century, Plyos had already become a favourite destination as a retreat for the nobility, artists and other holidaymakers from Moscow on hot summer days. It was at this time, when Plyos was a holiday town that the painter Isaac Levitan came here with his friends. Plyos' themes were reflected in Levitan's paintings called Quiet Abode and Evening Bells as well as in many others. One of his most famous works, Over Eternal Peace, was painted on the mountain which is now called Levitan's Mount. The Voskreseniya Church (Resurrection Church) was moved here from the village of Bilyukovo, and built in 1700. It is very similar to the one painted by Levitan (Petropavlovskaya Church or St. Peter's and St. Paul's Church, which burnt down in 1903). There is also a monument to the painter showing Levitan at work. The arrival of Levitan to Plyos contributed greatly to the revival of the town but in its new role as a resort. Plyos is still a quiet town, the main attraction of which is its amazing “living pictures” which make it look like a true open-air museum. The main street of the town is the embankment. In the past, all business life was concentrated here. The embankment stretches along the Volga for nearly 2 kilometres. Most of the buildings on it were merchant houses with living rooms on the first floor while offices and storage rooms occupied the ground floor. A small brick house in which Levitan stayed during his visits is also located on the embankment. His companion, the artist Sofya Kuvshinnikova, also rented a room in this house. Today, this house is the Levitan museum. Sofya was the wife of a police physician, an extraordinary pianist, a gifted artist and the hostess of a salon where celebrities regularly gathered. She accompanied Levitan on his visits to Plyos for several years. Now her name has become a kind of brand for the city. The historic Flour Trading Aisles Building houses Sofya Petrovna Kuvshynnykova's Cafe where “Levitan's favourite cookies” are baked today according to an old recipe. Over three summers spent in Plyos, Levitan painted as many as nearly two hundred works, including more than twenty paintings and numerous sketches, studies, drawings and drafts. Vasily Vereshchagin and Ilya Repin also came to Plyos at different times, and the town was visited by Fyodor Shalyapin (also spelled Feodor Chaliapin) who built his own cottage a few kilometres away from it. Today, the town provides an amazing combination of a quiet and leisurely provincial town on the Volga and a vibrant cultural life. If you go on a long walk through Plyos, you will discover more and more views and spaces and meet people with easels and canvases here and there. These people include both students and schoolchildren, and venerable and famous artists who follow Levitan's way to Plyos, this Mecca for landscape painters. Every summer, the town hosts a large number of international festivals and competitions: the Andrey Tarkovsky Zerkalo (Mirror) International Film Festiv, the Levitan Music Festival, the International Youth Festival of Photography, the Plyos on the Volga Festival, the Linen Palette and many other events. All this, just as in the nineteenth century, attracts artists, actors, writers and people who are not indifferent to the beauty of Russian nature.